Codebook is an application that runs natively on four different operating systems: Android, iOS, macOS, and Windows. Each platform has its own mechanisms for delivering software to your device securely, either through a store or some sort of direct download. 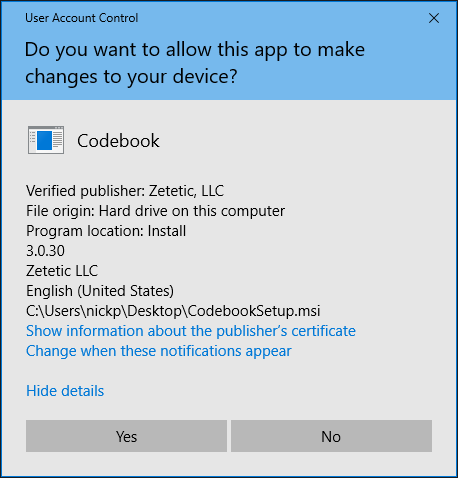 Since documentation of the security of the iTunes App Store, Mac App Store, and Google Play store is pretty readily available for those vendors, this article will focus on the security of downloading the Windows and Mac versions of Codebook directly from zetetic.net. We'll also discuss protections in place to protect you from downloading malicious binaries posing as Codebook. Codebook for macOS (the direct version, not the Mac App Store version) is distributed as a signed Installer Package that contains a code-signed macOS application (Codebook.app). Both are signed with Zetetic's Developer ID Certificate from Apple. macOS has a feature known as Gatekeeper that verifies the binary has been signed by Zetetic and that it hasn't been tampered with in any way (changing the binary invalidates the signature). To enable (or confirm) this behavior on your Mac, go to System Preferences > Security & Privacy, and ensure that "App Store and identified developers" is checked under "Allow apps downloaded from:"
In the output in response to our command above we can see that the system security policy (Gatekeeper) has validated Zetetic's signature and the integrity of the binary, approving it for installation. If we were to modify the binary (for instance, Show Package Contents, and remove one of the image resources), the code signature would be invalidated, and the check above would fail. At that point you'd no longer be able to launch the application. Codebook for Windows is distributed as an MSI installer package. The installer and the application itself are code-signed using Microsoft Authenticode technology. Code-signing Codebook for Windows allows a user to ensure the integrity and authenticity of the application on their machine. When the installer and application are code-signed, a digital signature is embedded within the files that can then be verified by Windows later. If the application binary was tampered with, the digital signature would become invalid and the user would be notified upon execution. Code-signing alone is not enough, as malware too can be code-signed. Windows includes a feature called SmartScreen that is used to validate the reputation of an application. While many components are taken into account when determining the reputation score, code-signing is one part in which the origin of the software publisher, identified by the digital signature are utilized.